All-Milk Protein Enriched with Vitamins + Minerals. Powered by Opti-Gut™ to Support Gut Health + Digestion. Easy-to-Mix for Fast Prep + Optimal Consumption. Nurtures 9 different species: Calves, Foals, Goat Kids, Lambs, Alpacas, Llamas, Elk Calves, Fawns, and Baby Pigs. 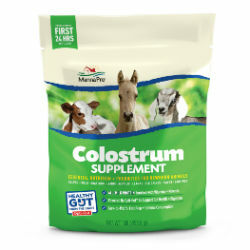 Feed Colostrum Supplement solution the first day of life as outlined below. Intake of colostrum is very important. If you have difficulty getting the animal to consume colostrum, contact your veterinarian promptly.